Income-tax investigation director Ujjwal Chaudhary visited nooks and corners of the Jamshedpur city to analyse the degree of financial fraud committed by former CM Madhu Koda during his two-year post in the office. His close associates are also believed to be involved in it. Income tax officials have found important documentary evidence which reveals that a Koda associate was negotiating to acquire a SEZ(Special Economic Zone) in Noida. After a series of raids conducted by the income-tax officials at the offices and residences of Sajjan Naredi and Ashok Kumar Kedia along with those of Sanjay Chaudhary, Bablu Ghosh, Binod Sinha on Sunday, the income-tax director Chaudhary visited Jamshedpur on Monday. On Tuesday, the direcotr visited many areas to collect evidence regarding investments made by the big shots of the Kolhan region. He then visited the Bistupur-based office. It also included the residence of Naredi where he assessed official papers related to investments of Rs 500 crore in various schemes and projects. Meanwhile, complaints of ill health of Koda proved to be little protection for the former Jharkhand CM. The IT department sealed some rooms and lockers at the Ranchi residence of former CM Mr Koda. Mr Koda and his associates might also be involved in 2000 crore scam. 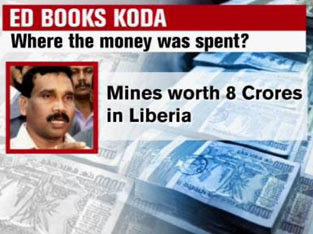 Mr Koda and eight of his other associates have been accused of amassing property worth hundreds of crores that included other countries like UAE, Indonesia, Thailand, Singapore and Liberia. With Madhu Koda hospitalised himself, he tries to lengthen the days of him being completely caught.